The Fresh Locations library is vast, diverse and includes so many stunning location houses of every size and style, but one thing these homes seem to have in common is that they are all the product of very talented and creative minds. Despite her incredible visual sense, she struggled a little when she first viewed this property, ‘We’ve always lived in Victorian and Edwardian homes as I wasn’t too keen on the Thirties look, it reminded me too much of my Granny and Grandpa’s home. And that is just what they found when they came to see this place – pure Grandma-chic with fussy wallpaper, frou-frou curtains and dubiously patterned lino and carpets. ‘David could see the potential but I found it harder to visualise at first’, admits Lucy with a laugh. 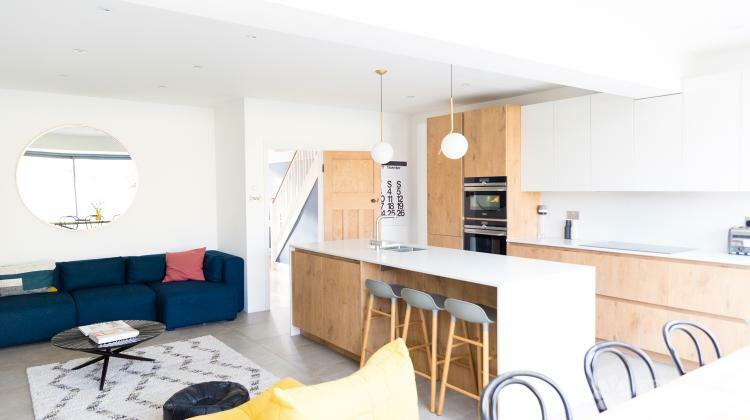 Despite Lucy’s initial reservations about Thirties homes, the couple have tried to stay true to the spirit and proportions of the building whilst giving it a fresh, contemporary feel. At the rear, they have incorporated a classic modern ‘glass box’ extension while the rooms at the front retain more of a period atmosphere. Although it was part of the plan from the start, the family enjoyed a break from the building work before summoning up the strength – and funds – to tackle the extension. Sure of what they wanted to achieve, they did the work without an architect, creating the plans in partnership with their builder, ‘it seemed the best option for the budget we had and it was pretty straightforward - as far as these things ever are!’ The couple wanted super-thin framed sliding windows but the prices were so expensive that again David scoured the UK until he found a supplier in Bognor Regis while he sourced the Siberian larch decking from a grower in Scotland. It was a similar story with the kitchen, inspired by a gorgeous wood-and-white Australian kitchen that Lucy had spotted on Pinterest, they found a similar version through German manufacturer Rotpunkt which David headed off to West Midlands to source. They teamed this with a matt white quartz worktop, ‘we initially wanted marble but everyone warned us off it because staining is such an issue.’ They wanted the kitchen to be practical, stylish and as timeless as possible, ‘a seamless unfussy look’ so there are no handles on the cabinets and the same quartz is used for the splashbacks and the countertops. Despite having used location houses throughout her fashion career, Lucy did not think about placing her house with a location agency until another friend in the business suggested it and friend who own Fresh Locations’ popular ‘Foxgrove’ location nearby, encouraged her to go for it.